In the last 20 months since April 2011 I have accomplished things that I never thought I would. I gave running a try and since then it’s all I ever associate with. As of December 2012 I have ran 16 races including my first half marathon, and clocked in hundreds of kilometres of running, either for fun or training for a race. I have also made many wonderful friends who share the same passion and interest and I thank them all sincerely for showing me the true meaning of comraderie. I endeavour to bring the same (if not more) spirit of health and fitness into 2013. Here’s to another year of fun and running! Wowww good job Fairy, job well done… This is just the beginning of your new chapter in runninghood… 2013 should be filled with more extravagant running events… Cheers to that! Thanks Hafiz, always nice to have someone encouraging me. 🙂 Still got a long way to go but I am looking forward to the journey. wow! i like how you place all the medals accordingly..also how you have decorated the medals on xmas tree..creative idea, i like it! where did u get that coool hanger “run like a girl”? 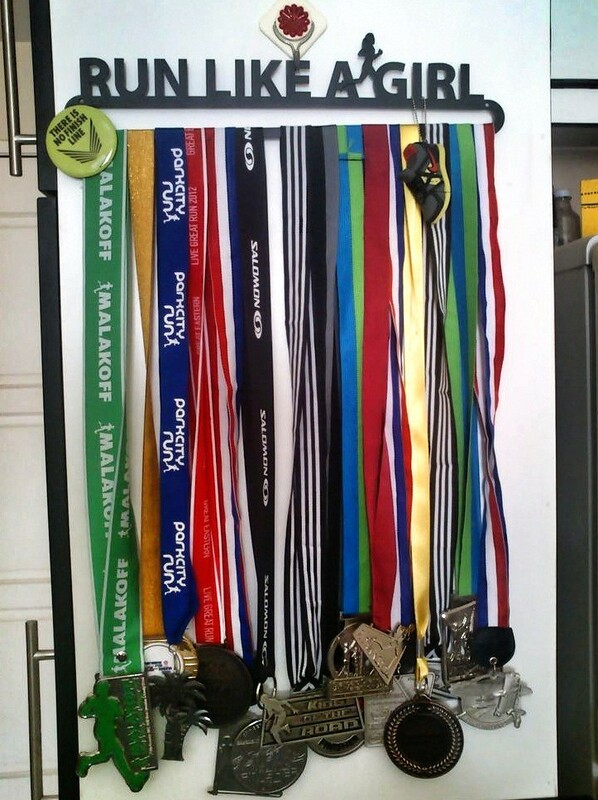 i place my medals in jewelry box bt the collections are growing so i probably need something else now to hang more medals. Did u join the recent MPIB Run 2013? Hi Emmy, happy new year to you too! Thanks so much for leaving me a comment, getting one is just as good as earning a medal from a race. 🙂 And thanks for following my blog, it’s definitely one of my passionate pastimes apart from running! I got the medal hanger for my birthday last year from a good friend (I get asked this a lot). It’s from the US, you can order it from Amazon (search “Run Like a Girl” medal hanger – you’ll find it). Alternatively you can search Sukan G in FB, there’s a group of girls (you may know them) who are selling t-shirts and accessories, including medal hangers just like mine. And oh, next time you see me anywhere, race or elsewhere – say lah Hi. 🙂 Don’t be shy! @Emmy, insyaallah joining MWM, plan on doing the 1/2. You doing full? Good luck with that! 😛 You’re going to dress up? As to why MWM is “rather steep”, you tengok lah who is the guest speaker and person flagging us off. 🙂 Make sense? Plus I think it’s quite ok lah the pricing, I rasa Borneo Marathon lagi mahal.